before. But it was great helping all these people. I thought it would be fun to walk through a timeline of how everything went down. I’m ignoring all the regular flight planning and monitoring work we did during the day and only showing clients that had something go wrong. It all began the night before. (Times are approximate on Pacific Time based on what we could dig up in our email and phone records – it’s the best I can do considering how crazy things were.) Some of the client names have been changed. On Tuesday into Wednesday, we had plenty of people who were nervous about the weather rolling in and had asked to make changes. We helped with that, but it wasn’t until Wednesday morning that cancellations started. 8:52am – Jim was flying from Philly to Houston on US Airways on Thursday, and that flight canceled. Jim had already seen his flights canceled getting to Philly a couple days earlier, and now he had the double-whammy. Our concierge David went back and forth and ultimately Jim decided to play it safe and rebook for Friday morning. 9:59am – Mary and Lauren had flown into Houston for the day but just before they arrived, their return to Nashville on Southwest canceled due to the expected ice. I was able to get them rebooked on the 645a the next morning (hoping it would go), and I scrambled and grabbed them the last 2 rooms at their preferred nearby hotel. 10:20am – Stan was flying back to Newark on United but he decided to stay longer and fly back on Thursday. Bad plan. Our concierge Derek let him know about the expected weather and he quickly rebooked to go back out again Wednesday to beat the weather. 10:21am – Jessica, Matthew, and Jason were all booked to fly on United through Newark to Tel Aviv on Thursday and they weren’t liking their chances of making their already relatively short connection (by Newark standards). Of course, United only flies to Tel Aviv via Newark, so we tried to get them switched to Air Canada via Toronto but United wouldn’t allow it. We just had to keep watching. 11:01am – I told Jane, the coordinator of one the big groups, that they had a few travelers who were likely to be in trouble with their travel plans. She went back to them to see if anyone wanted to change. 11:12am – Southwest canceled an early morning flight from Nashville to Tampa on Thursday, making a planned day trip for Brad impossible. He scrapped the trip, so I canceled everything and got a refund. 1:00pm – Jane came back and said one of the travelers in jeopardy wanted to switch to a redeye Wednesday. Kevin finished the rebooking under the weather waiver rules just a couple minutes before his original flight canceled. By now, most of the pre-canceling seemed to have been done so there was a lull as we waited to see how bad it was going to be. Things started canceling again once we got into the evening, but it didn’t pick up until after midnight. 8:02pm – Jeff was worried enough about the storm that he left Nashville for Denver a day early on a different airline than originally booked. We waited to cancel his original reservation because we expected the flight would cancel and we could get him a refund. It did, so we did. 1:00am – Remember Jessica, Jason, and Matthew? United canceled their flight to Newark a mere 5 hours before it was to leave. Fortunately, Derek was on the case. I had sold the last new Air Canada flights via Toronto into their reservation. but United couldn’t see it and said that meant the ticket couldn’t be reissued. Derek pushed until they made it work. 2:12am – An urgent call came in from Melissa. She and her family were flying Dallas to Miami but their flight canceled. They had a cruise the next day but American said they were out of luck. Kevin found them an option to go to Pensacola, spend the night, and then go on to Miami in time for the cruise. The first American agent didn’t want to allow that for some unknown reason, but we pushed over the phone until another agent allowed it. 5:25am – Walt’s flight from Hartford to Baltimore on Southwest already posted a delay. His connection to Columbus was in jeopardy but we figured that would delay too. I took the wait-and-see approach. 5:31am – John already had one flight from Portland to DC cancel and now his second one canceled as well. David put him on a Friday morning flight (which would also ultimately cancel, incredibly – he ended up on Southwest to Baltimore). 7:24am – Tammy was flying via JFK to Tel Aviv on Delta, and the airline delayed the flight to JFK making her miss the connection. Our concierge Jamie saw space was very scarce so we just purchased a coach seat on a United flight which would help her make the connection. Remember this name, because it got uglier. 7:50am – Anthony was flying from Newark to Tel Aviv (starting in Newark, not connecting) on the early United flight, and he was worried. Our concierge Alex talked about switching him to the later flight to Israel but convinced him to stick with what he had. 8:15am – Ryan had come into Philly on a redeye and was connecting on to State College. We figured that would be trouble, and sure enough, it was delayed. It hadn’t canceled but David was keeping a close watch on things. 9:42am – Tammy’s luck turned for the worse. The United flight was delayed a couple hours so that would no longer be a possibility (or so we thought). We voided out that ticket and went to work on other options. The best we could find was a connection via LA and Paris to Tel Aviv on Delta and Air France. Tammy was already (understandably) exhausted, and really didn’t want a double connect, so Jamie kept working on ideas for her. 10:15am – Ryan was on the airplane to State College, but they didn’t get off the ground. Everyone got off the airplane and we all watched as other flights canceled. His still was just showing as delayed, so fingers were crossed. 11:15am – Tammy decided to go with the double connection, but of course, her flight to LA ended up being delayed for no good reason. She ended up with just over an hour in LA to get between terminals. She was getting nervous because the Air France website showed her as being standby. It turns out that’s what Air France says when you don’t have a seat assignment. Bad choice of wording. 11:40am – Walt’s flight from Hartford to Baltimore delayed again. He was on the airplane and for that reason, Southwest’s system showed the flight as active. I was told we couldn’t put him on the later connection to Columbus while he was still considered inflight. In the meantime, that flight filled up. We could only have him go standby. 12:14pm – We were still dealing with Thursday, but clients traveling on Friday started getting nervous. We weren’t seeing huge numbers of cancellations for Friday so we just told them that we were watching and they shouldn’t make any moves yet. 12:40pm – Anthony was on his flight from Newark to Tel Aviv but the weather was causing delays. It kept slipping more and more, but they assured him it was going to go. Of course, we wouldn’t just believe that. Alex was watching with backups in hand. 12:50pm – Walt’s flight from Hartford to Baltimore finally canceled, and he decided to skip the Columbus bit and go straight home to Nashville instead. Southwest had no seats for days (even out of Boston or New York). He booked a hotel room on his own, but I told him to cancel it. I got him on Delta via Atlanta just over an hour after we spoke, and it was cheaper than the Southwest flight originally. Then I had to coordinate with the others going into Columbus (this is a small business client) to make sure they had what they needed. All ended up well, except that the hotel in Columbus wouldn’t waive the penalty despite the bad weather. Oh well, rules are rules. 1:25pm – Ryan was back on his airplane and this time it actually got airborne and made it to State College. 1:36pm – Michael was flying Friday from Key West back to New York but he wasn’t willing to wait to see if his flight would go. David changed him to a later flight giving more buffer. 3:00pm – Anthony’s plane finally pushed back in Newark. It wasn’t too long (by Newark standards) before he was airborne. 3:30pm – Tammy made her connection in LA and was on the airplane to Paris, able to relax. Meanwhile, her traveling partner Nick, who was starting in New York, saw his Delta flight to Israel start to delay. Jamie was watching. 4:15pm – Nick’s flight delayed even further and we had to make a decision. Jamie suggested he move to an Air France flight that would actually have him meet Tammy in Paris, and then they’d fly together after a long layover. Nick liked the idea but missed the check in cutoff. Fortunately, there was another later flight to Paris he could take. Nick didn’t miss a beat. You’d think he’d be in a bad mood, but no. Before he left, he asked Jamie to make him a lunch reservation at a place he found near the airport so he could take advantage of being in France, if ever-so-briefly. Looking back, it’s a good thing he chose this option. The Delta flight ended up being delayed 17 hours. 9:00pm – The last of the inbound aircraft arrived at its destination for a morning departure for our client. We felt pretty confident that Friday would go well. After a long but fulfilling day, I went straight to bed. The team really did a fantastic job getting people where they needed to be. I can confirm that Houston sucked donkey ****, last week; Tuesday, I flew LHR-IAH-SAN, with nearly two hours in IAH – it wasn’t enough to get through immigration, I missed my connection, and caught the last UA flight to SAN, taking the last seat, 4 hours later. Sunday, the 787 that had arrived from Lagos at 5am in IAH had sat off-stand all day, was late being brought to the stand for UA97 to LHR, then developed a problem at the stand, and we ended up with another 2hr delay. Not really blaming UA for the first issue (although perhaps IAH should issue ‘fast-passes’ for the immigration hall for people with tight connections – at least two A380’s arrived just before our 787, and there were only 5 officers ‘working’……). Glad you did some good business, Cranky. I spent Thursday sitting in Accra, wondering whether the plane for my Friday flight home was going to make it out of JFK. (It did.) You guys found time to keep an eye on that issue, among all your other chaos. So, thanks! Grichard – Ah yes, Jamie was watching that one. We were happy to see that airplane get on its way to Ghana the day before you flew. What are the weather waiver rules you mention? What was the hotel in Columbus? Because “rules are rules” and I have a rule against staying places that apply rules blindly without compassion or concern for circumstances. Hovig – That would be the Hilton Garden Inn Columbus University Area. That’s Exhibit A as to why I tell anyone who’ll listen that it’s an extremely terrible idea to try and fly into port on the day that your cruise sets sail (not your doing obviously). Fly in the night before. Don’t risk leaving your expensive cruise at the whims of mother nature! That’s a lesson Melissa would have learned the hard way if your team hadn’t come to the rescue. MeanMeosh – They did fly in the day before, and that’s precisely why we were able to save them. They spent the night in Pensacola but made it he next day in time for their cruise. Dulles was a mess. I sat on a regional jet for a total of 4 hours at the gate … boarding, sit, sit, sit … add more fuel and offer to unload people who didn’t want to go anymore … sit … sit … sit … taxi, de-ice, then fly for 60 minutes. IAD – CLT. I barely made my connection to PHX. But I made it. Dulles closed our taxi way behind us so they could clear it out the snow. US Airways was ready to go, but since the road was closed, we had to sit. I tweeted Dulles saying thanks for blocking us in. They responded ‘safety first’. Turns out they were clearing the taxi way for the Lufthansa 747 who backed up right after us. 747 > regional jet. You guys are doing the Lord’s work. Keep it up! I flew PHL-SFO (on United, not that it matters in this case) last Monday morning. Weather the night before had delayed the crew’s arrival in PHL, so departure was pushed back from very early morning to mid morning. We eventually got underway, but because of very high winds aloft (~200 mph we were told) we had to stop at KCI to refuel. The pilot noted that quite a few flights were having to do the same. How often does this happen for west bound transcon flights? When the new planes come out, will the carriers still carry enough fuel to make it a non-issue, or will some try to cut the extra fuel a bit tighter (still not to the point of being unsafe, I know) and roll the dice on a potential unscheduled fuel stop? How predictable and steady are winds aloft 5-6ish hours ahead of time? Kilroy – They won’t play games with that kind of thing. Winds are fairly well known and they’ll always put some buffer in there when they’re planning. The issue today is that it sometimes just doesn’t have enough fuel capacity to make it. Just to be clear, the fuel stop I experienced was announced as a necessary response to the day’s wind conditions before we departed PHL, in fact well before we boarded. Having contemplated in the past using a booking service for award tickets, I am wondering whether these folks were on paid or award tickets, how much that matters (if at all) in bad weather situations and if your work to rebook customers is included in the original price, or comes at an extra cost? This post sure makes me think I’d enjoy doing business with you; you sure have your clients’ backs! Elainepdx – We had a mix of everyone on here, but most that day were paid. Some we had booked, which is always best because if something goes wrong, we can then just put the new flights in the reservation ourselves. But others, including the urgent call in the middle of the night, were booked elsewhere and we just worked with the airlines. In terms of reacommodating if something goes wrong, it doesn’t matter if it’s paid or award. It should work the same (though some airlines can get testy). Thanks, CF! I just took a peek at the services you can provide and understand better how it works for your customers during a day of cancellations. I will absolutely keep you in mind for future travel! Thanks for the insight into the services you and your company provide. 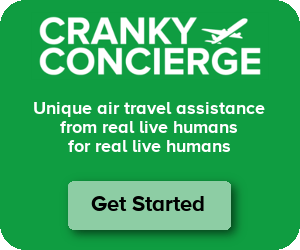 I can attest to the great job Cranky and his staff do. I’ve been using them every flight for several years now. A few years ago when there was an August hurricane bearing down on New England, my then 10-year old son and I were there on vacation visiting my family. The hurricane was due to hit either IAD or EWR (I can’t remember which) right as we were supposed to connect leaving BOS and heading for LAX. It took a few extra days, but they got us home safe and sound. I’d say >90% of the time, my flights have no issues. But that <10% of the time, I've been glad I used their service. Always frustrating when hotels stick to cancellation rules, when it’s really no ones fault. The weather is the weather! I guess I’m just used to airlines which are much more strict about sticking to fees. So, while I do expect hotels to be more lenient (since they usually are), I can’t fault them for not sticking to the fees when they do.